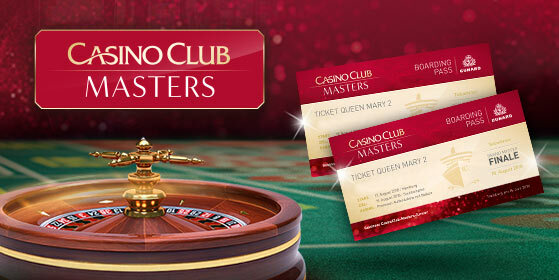 Here comes your players’ last chance to take part in the CasinoClub Masters Race – a unique opportunity to win a ticket for a weekend on a world-famous luxury liner and the chance at 25,000€ in a roulette game onboard. CasinoClub is giving away a grand 40,000€ worth of prizes during the boat trip – this ticket is really worth a final shot! Time to set sail and win big! To participate, players need to register for the race between July 1st and 29th. The race for Master Points, which can be collected in all games except Blackjack, begins on July 16th. The boat trip will take place from August 17th to 19th. Terms and Conditions | Testimonials | Privacy Notice |Cookie Notice | © 2018 GVC Services Limited . All rights reserved.